If you are a parent, who gets worried at the mere thought of vaccinating your little one or gets stressed seeing your child in post-shot-pain; you are likely to consider painless vaccination for your little one. Yes! 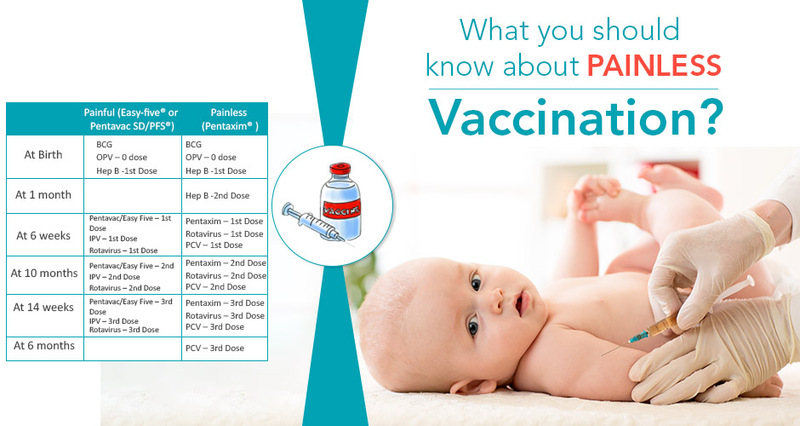 There is indeed a way to get your baby vaccinated without the pain and associated discomfort through painless vaccines. However, before you decide to take the painless route you must understand what these vaccines are all about and how do they fare in comparison to the conventional doses of immunization. #1. What is a painless vaccination? Painless vaccines are a modern-era invention in the arena of immunology. They are acellular, syringe injectable, medicines that contain fewer antigens (a toxin or foreign substance which induces an immune response in the body, especially the production of antibodies) as compared to the conventional vaccines for the same disease. Antigens are foreign elements introduced in the body to encourage it to produce a immune response against it and eventually protect the body from being harmed by the disease that those antigens cause. As compared to the whole-shot vaccines, painless vaccines contain less number of antigens and therefore, the side-effects are less too. So far, painless vaccination has only been developed for whooping cough or Pertussis. It is sold in India as DaPT, which stands for Diphtheria, Acellular pertussis, Tetanus. #2. What makes the painless vaccine, painless? As this vaccine contains lesser number of antigens, it automatically causes lesser degree of side effects including pain and fever. Therefore, your baby feels less pain and the injection site swells less in comparison to regular vaccines. However, this does not mean that the process of injecting is not going to pain. #3. How is Painless Vaccination advantageous over the painful one? Painless vaccines do not cause high fever to your baby. As a result, your little one is less irritable, and uncomfortable. As an after-effect, the redness and swelling is very less. #4. Is painless vaccination less effective than the painful vaccination? It is believed that painless vaccines could be less effective due to reduced potency of the antigen in the dose. However, the findings on ground are still inconclusive because there is just DaPT vaccine, which is painless as of now, and more research is needed in the arena. Although, studies do reveal that reduced immunity-stimulating elements in DaPT make it comparatively less immunogenic. As a result, the medicine wanes away faster. This means that its effect will not last as long as the conventional painful medicine. The single shot of painful doses contains concentrated amounts of the antigens, which produce more antibodies to give better protection. According to the Indian Academy of Pediatrics DaPT (painless vaccines) should not be given as the primary series of inoculation. For the primary doses only DPT (painful vaccine) should be given. The painless version can however be given as the subsequent booster doses. Also Read: Can my child get his missed vaccination at later date? The painful version is DPT, which stands for – Diphtheria, Tetanus, and Pertussis. The painless vaccination available in India is DaPT, which stands for – Diphtheria, Tetanus, and Acellular Pertussis. Both these vaccines protect against five diseases. However, the combination is different. Depending upon the vaccine, you choose (painful or painless) the immunization schedule of your child will change. This is because where Easy Five offers additional protection against Hepatitis B; Pentaxim offers additional protection against Polio. 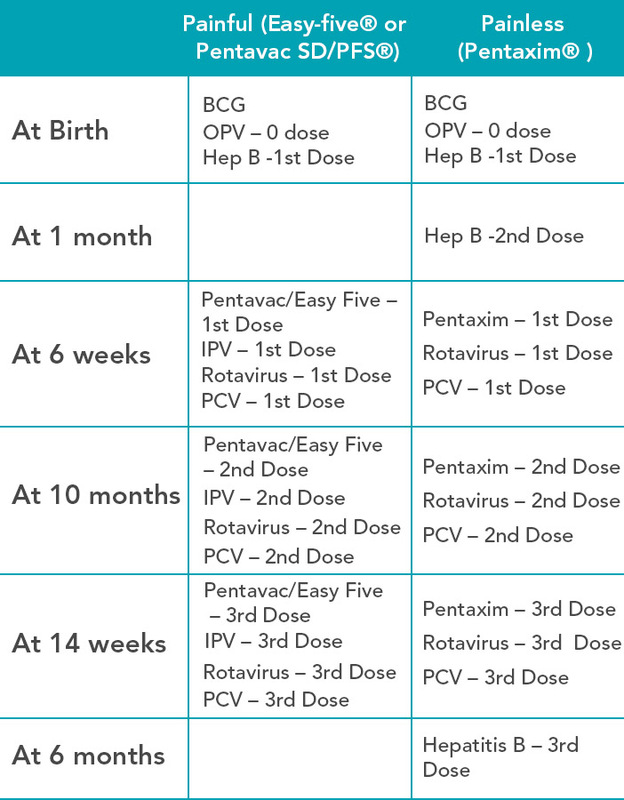 Therefore, if you give your baby Easy Five then the baby will get a separate dose of Injectable Polio Vaccination (IPV) and if you give your baby Pentaxim, then the baby will get a separate dose of Hepatitis B vaccine. Also Read: Which vaccinations are compulsory for my child and why? The DPT vaccine is less expensive as compared to the painless DaPT vaccine. Pentavac costs around Rs. 500/- to Rs. 600/- in India, whereas Easy Five ranges between Rs. 585/- to Rs. 750/-. Pentaxim is expensive and costs between Rs. 2000/- to Rs. 2300/-. Depending upon your pocket and the type of vaccination schedule you wish to follow for your child you can choose the type of vaccination for your little one.